If you’re trialling veganuary you better look away now. Whilst even I have to admit that the predictable Christmas fare of cheese, paté, rich fruit cake and heavy roast dinners does get a teeny bit too much, I have faaaaar too many foodie delights to use up at the beginning of the year to make my diet solely plant based. The omnivorous recipe books that were gifted to me are NOT going to remain untouched whilst I eat chickpeas and lentils for a month (as nice as those things are when treated in the right way). Plus, January is depressing enough without denying oneself all dairy, meat and fish. I need something to get me through the let down of Christmas being over. Much like my three year old son, who has to be reminded of the myriad of exciting toys he was given when he bemoans the conclusion of the festive season, I also need reminding of the bounteous delights that were given to me to get through the dismal, bleak month of January. I received some stupendously gorgeous chocolates from my sister in law (made in Liverpool, where she lives), which really had to be eaten without delay. And the chutneys from the hampers we received are just begging to be trialled with some soft cheese and cold meats. That being said, I am trying to reduce the amount of meat and animal based products I eat just a little. It’s been clear for a long time that a plant based diet provides an array of health benefits, but a lot of research suggests that even reducing the amount of animal products that you consume can improve your health too, whether it’s preventing weight gain or reducing the risk of heart conditions and type 2 diabetes, alongside some cancers. Added to this are the environmental benefits of relying less on energy intensive meat products. So, plant milks, tofu and chia eggs are being trialled (with varying degrees of success), but there’s no way I can go the whole hog (pardon the pun) and completely give up all animal products. And if you are anything like me, you’ve got a mound of dairy rich christmas chocolate still in the cupboard. It can’t wait till February, my friends. 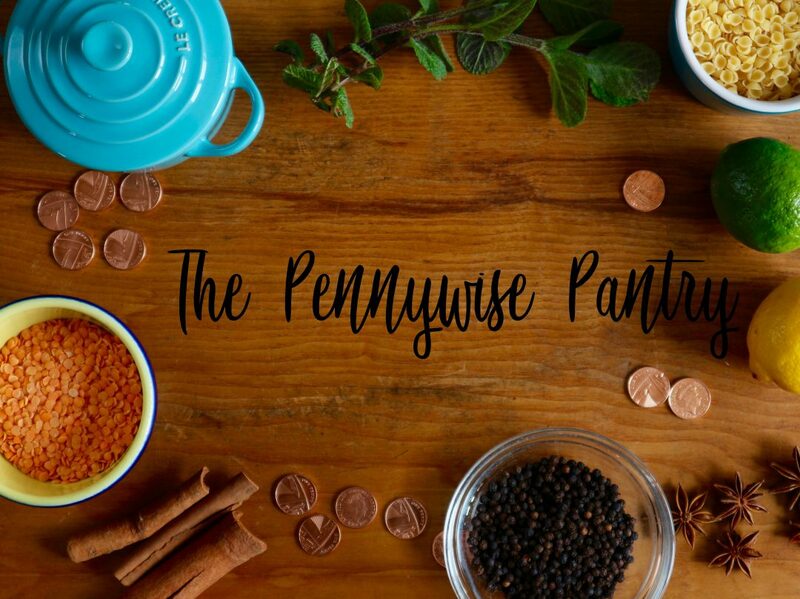 This recipe is really one of those that epitomises the essence of the Pennywise Pantry. It was born in the wake of Christmas’s excess, all the ingredients leftover goodies from the festive period. And leftovers, in my book, are as exciting as the original event. As hubby is a minister, we also get all the surplus carol service supplies (the congregation knows nothing goes to waste in our house) so boxes of biscuits and mince pies get delivered to our house as soon as the festive services are over. And as much as I like a mince pie, come January, I’m a little over them. So this is the perfect way to put a new year spin on some redundant festive treats. It’s a little fiddly to separate the pastry casing from the mincemeat but it doesn’t really matter if it’s a little rustic. Butter isn’t necessary to hold the mixture together as the pastry crumb is already full of it (or other fat). You can use any chocolate you like (depending on what’s lurking at the bottom of the chocolate tin) and add dried fruit or nuts according to your taste or what you want to use up. And if you check the ingredients, you might even inadvertently be creating a veganuary treat. Many mince pies are dairy and egg free, and most dark chocolate with at least 70% cocoa solids don’t contain milk. So happy veganuary, or January, or simply Happy 2019 you’re reading this later in the year. May your Christmas goodies be put to fabulous use. Line a 20 by 20cm tin with clingfilm or parchment. Melt 200g of the chocolate over a bain marie or in short bursts in the microwave and set aside to cool a little. Meanwhile, with a rolling pin or in a food processor, create fine crumbs from the pastry cases and biscuits. Sprinkle over the cocoa powder and mix well with the melted chocolate. Press firmly into the tin. Mix the mincemeat, cranberries and pistachios together (you could even add some orange zest for a little more zing) then press onto the chocolatey pastry mixture. Refrigerate for an hour or so. Melt the remaining 150g chocolate and the 20g white chocolate. Pour the chocolate over the top of the mincemeat mixture, tipping the tin a little to ensure even coverage. Whilst the chocolate is still warm, drizzle lines of white chocolate over the surface, using a toothpick to make pretty patterns. Place the tin back in the refrigerator for 15 mins to set and then cut into 12 pieces.